The ABCD Diaries: Teeth Whitening Trays from Smile Brilliant #Giveaway! Teeth Whitening Trays from Smile Brilliant #Giveaway! Smile Brilliant Teeth Whitening Tray Giveaway! 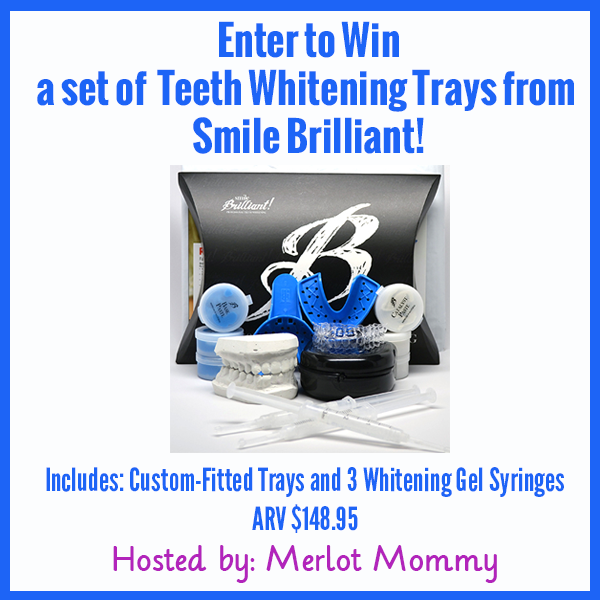 The giveaway is sponsored by Smile Brilliant and hosted by Merlot Mommy. With all of the foods we eat, even with great dental hygiene our teeth can become stained and yellowed over time. Want to learn more about a great home teeth whitening system from Smile Brilliant with professional quality results?Merlot Mommy had a chance to try out the system and loved it. You can read the full review from Merlot Mommy. Enter to win your own Smile Brilliant Teeth Whitening Trays Kit (ARV $148.95) by using the Rafflecopter below. Entry is optional. All entries will be verified. Open to continental U.S. residents ages 18 and older. One entrant per household. Neither Merlot Mommy nor any of the other participating blogs are responsible for prize fulfillment. I would love to win because my teeth need whitening and this would work nicely. why am I interested in this kit? I drink Coffee! I drink Merlot! LOL Oh yes I sure do. And I will not give up either. The coffee.. oooo does that stain. Unless you whiten- and you drink coffee- you end up with very very brown teeth indeed. Many I'd love this kit. I would love to win because I'm in my 50's and I've been a coffee drinker about 35 of those years. I need to whiten and brighten. I would love to be able to whiten my teeth professionally at home. I want to win this because I drink a lot of coffee and it will help whiten them again. I drink Ice Tea all the time and my teeth can yous some help.